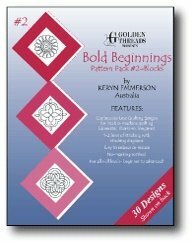 Continuous line quilting designs for hand or machine quilting. 1-2 lines of stitching with stitching diagrams. Easy to enlarge or reduce. No-marking method.